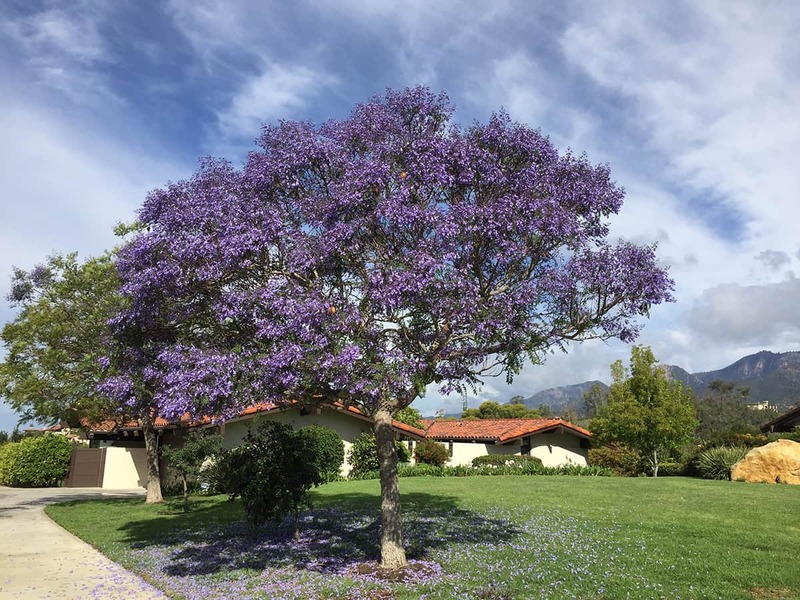 It’s not surprising that the Jacaranda is one of the two Official City Trees of Santa Barbara (the other is the Coast Live Oak), because they seem to be in magnificent bloom everywhere you look in the spring! Jacarandas have been planted in Santa Barbara County since their introduction here in the late 1800’s, and, because of their beauty, more of them have been planted as street trees in the City than any other tree species. Their fabulous display of vivid, lavender-blue flowers has occurred much earlier than usual this year. Some are in dramatic bloom all across their canopies, but have no leaves at all, which makes for a spectacular show. Others have flowers and also sport light-green lacy foliage, a combination that is delightful whether seen from up close or from afar. Jacarandas are so well adapted to our Central Coast climate that one might think they are native to California, but they actually come from South America. People have been so taken by them that they have been planted in practically every city in the world which has a Mediterranean climate, like ours, or a subtropical climate. The botanical name for the Jacaranda is Jacaranda mimosifolia. The genus name, Jacaranda, comes from the language of the indigenous people of its native region, and translates as “fragrant”. The species name, mimosifolia, means it has leaves similar to those of the Mimosa tree. 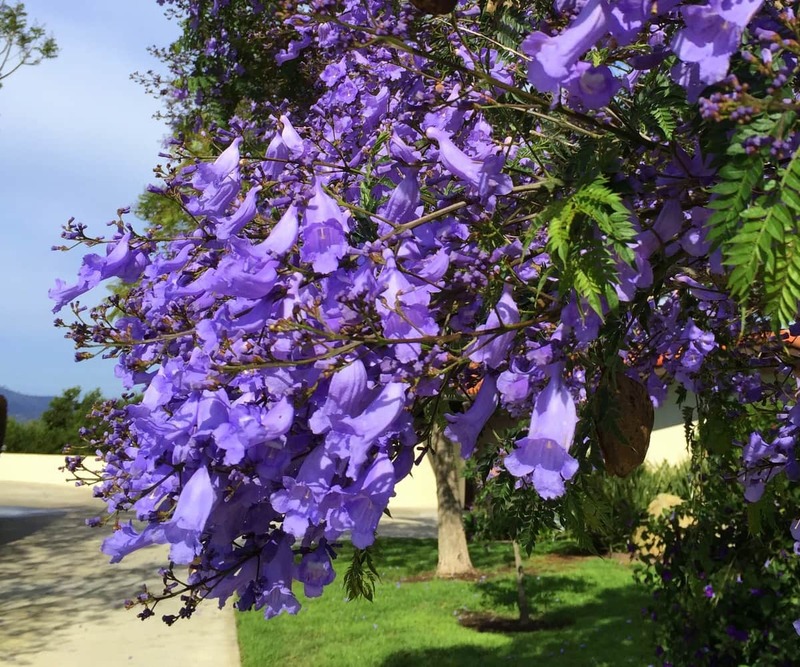 It is sometimes commonly known as the Blue Trumpet Tree or Blue Jacaranda, but most in Santa Barbara just call it Jacaranda. Jacarandas are well adapted for use as street trees and in most home landscapes. Their mature height is 25 to 30 feet in height and spread; they can get taller in ideal conditions, but are easily maintained as a medium-sized tree. Tidy in growth habit, they require little in the way of pruning, other than removing any dead branches and the occasional vigorous sprout. Their flowers are 1-1/2-inch-long and trumpet-shaped; in Santa Barbara, these usually appear in the late spring or early summer, but can start earlier if the temperature is warm. Trees which have been grown from seed can take as long as 5 to 7 years after planting out before their first bloom occurs – and so require patience – which will be rewarded! Spent petals fall in profusion, resulting in an amazing lavender-blue carpet beneath each tree; some folks see this as a lovely bonus, others as messy! The seed pods that remain on the tree are 2 to 3 inches across, and can be used in dried flower arrangements and decorations. 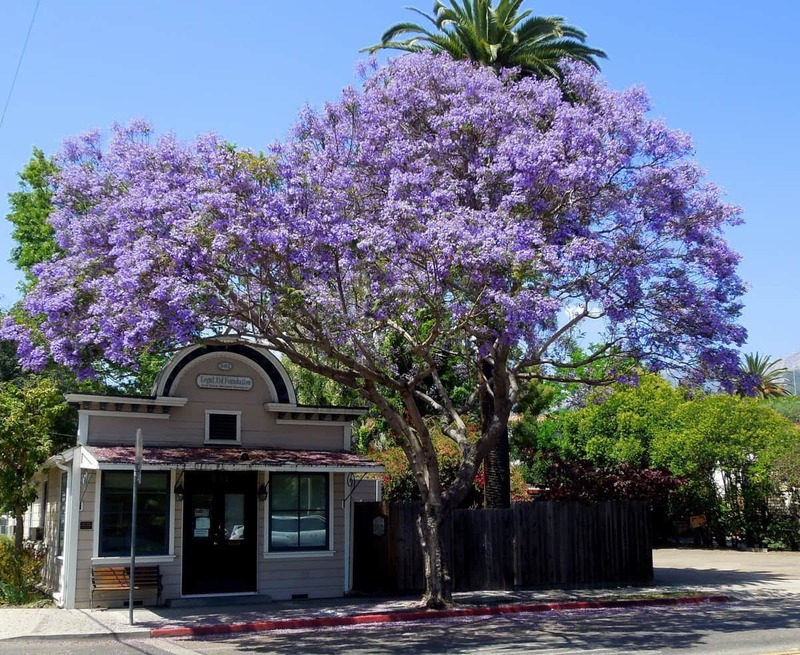 Jacarandas can be found all over town, but older, mature street tree specimens can be seen on Carrillo Street (between Santa Barbara Street and Olive Street), on Mission Street (West of Highway 101), on Montecito Street (between Olive Street and Soledad Street), and on Chuparosa Road. You really can’t miss them – they are eye-catching! Santa Barbara Beautiful has initiated the Tree-of-the-Month article, as a way to increase awareness and appreciation of Santa Barbara’s many outstanding public trees, in conjunction with their ongoing program to fund tree planting along the City’s streets, which has resulted in the planting to date of more than 12,000 street trees.